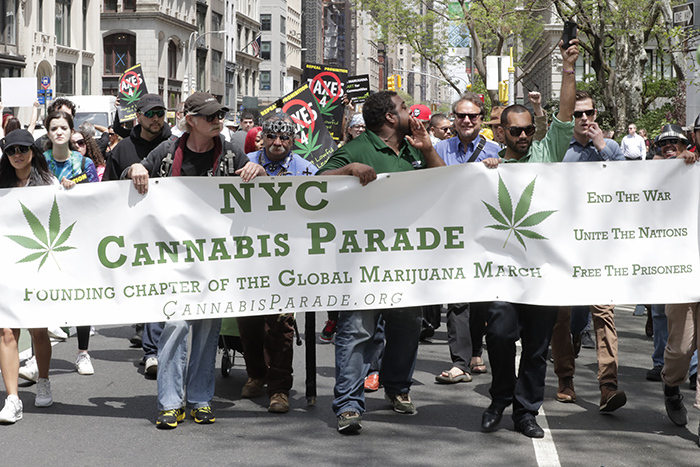 Midtown Manhattan, New York, USA, May 05, 2018 – Hundreds of Peoples Marched in support of the legalization of marijuana and Participated on the 2018’s Cannabis Parade & Rally today in New York City. “Over the last 10 or 15 years, the American people’s attitudes have changed dramatically,” he said in an interview. “I find myself in that same position.” Global Marijuana March events will be taking place all over the world on May 5. In New York City, Guardian Angels founder Curtis Sliwa is not only part of today’s Cannabis Parade – back on April 20, 4/20, he formalized his use of medical marijuana, at one of the new dispensaries in New York. Those also pushing for legalization at the parade include Manhattan Assembly Member Richard Gottfried, State Senator Jesse Hamilton and Joel Giambra, former County Executive for Erie County in Western New York and currently seeking the Reform Party’s nomination for Governor. Showing, like Boehner, the increasingly bipartisan nature of the legalization movement, Giambra won two terms as Erie County executive, running as a Republican in a predominantly Democratic stronghold.